Jigme Tenpai Gyaltshen, the First reincarnation of the Drupthob Namgyal Lhundup, was born in 1788 (Earth Monkey Year) at Trellar in Trongsa. Many auspicious signs accompanied his birth, such as the appearance of two suns in the sky and turning of water into milky colour for three consecutive days. At five, he declared himself as Drupthob Namgyal Lhundup and insisted on going to Jangchub Pelri Gonpa. He was able to describe the Gonpa in detail. His former attendants took him to Jangchub Pelri and enthroned him as the Second Padtselling Trulku. He took the lessons from the former master’s two main students Namgyal and Shacha. 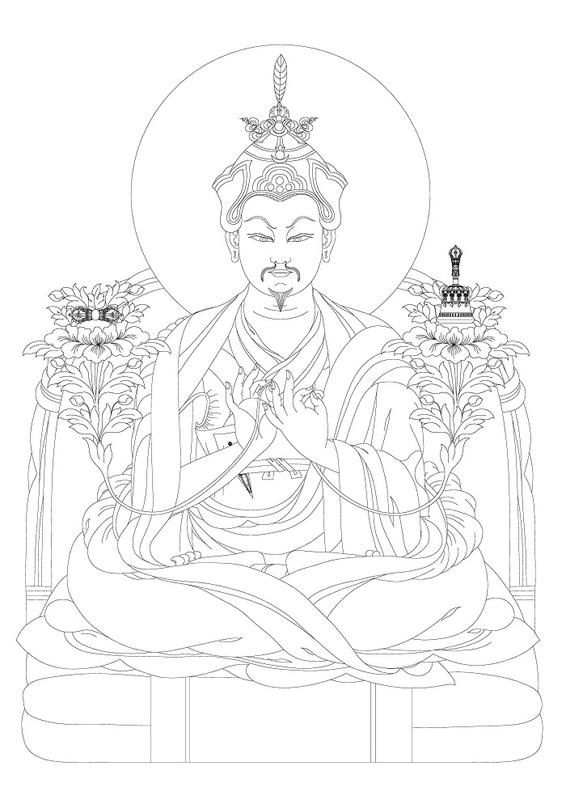 At the age of eight, he took the vow of genyen (lay) from Jigme Lingpa and was given the name, Jigme Tenpai Gyaltshen. Following the orders of Rigzin Jigme Lingpa, he went to study under Jigme Kundrol at Yongla Gonpa in eastern Bhutan. There he received all the teachings of his former incarnation. He was only nine. At the age of eleven, he went to study under Jigme Lingpa in Tibet. But soon Jigme Lingpa passed away that same year. He received a statue containing his great master’s relic as a consolation. He then went to Mindroling where he received the vows of the preliminary (genyen) and novice monk (getshul) from Khenchen Tenzin. He spent the next five years mastering the thirteen major philosophical texts (zhungchen chusum) according to the Nyingma tradition, as well as Kama (bka’ ma) and treasure texts, ultimately earning the title of Lhomon Geshe. To mark his graduation, Jigme Tenpai Gyaltshen distributed a roll of pangkheb to every monk at the monastery. After making offerings to the Lhasa Jowo and going on a pilgrimage to Samye and other places sacred to Padmasambhava, he returned to Bhutan, arriving in his nineteenth year. During that time, the practice of any religious tradition other than the Drukpa Kagyu required the approval of the government. So, in the year 1808, he obtained permission to continue the tradition and lineage of his former incarnation. The Desi gave him a gift of a cymbal that was named Puntang Madrakpa, which is preserved today at Jangchub Pelri. He then returned to Bumthang. In 1809, Jigme Tenpai Gyaltshen expanded Jangchub Pelri, the monastery built by his predecessor by adding an additional floor, a new temple, and a residence. After its consecration, he entered into a three year retreat, and is said to have experienced a number of important visions such as the three root deities of the Longchen Nyingthig and Jigme Lingpa. At the end of his meditation, now twenty-five years old, Jigme Tenpai Gyaltshen went to Tibet. While there, he received his complete ordination vows (nyendzog) from Minling Khenchen Kunden. From Minling Trichen Pema Wangyal, Terchen Garwang Tingzin Gyalpo, and the Sixth Lhalung Sungtrul Kunzang Tenpai Gyaltshen (1763-1817) he received many empowerments, transmissions, and instructions and advice. Once again, Jigme Tenpai Gyaltshen made offerings to the Lhasa Jowo and the monks of Mindroling, and then returned to Bumthang. Not long afterwards, Jigme Kundrol of Yongla Monastery passed away and so Jigme Tenpai Gyaltshen went to Dungsam. He stayed there for a quite a long time and performed the funeral rites, taught the regent (latshab) Dorji Gyaltshen, and gave more teaching and blessing to the patrons in the region. Upon his return to Bumthang, Jigme Tenpai Gyaltshen continued to teach his followers. As requested by his patrons and devotees, he built Phuntsho Pelri Monastery, Muktsen Naykhang, Dungsam Khangmai Lhakhang, and Sengor Lhakhang. To every household of Sengor he gave a ‘prosperity vase’ (yang bum) in recognition of their service as the first patrons of his previous incarnation. Many houses of Sengor retain these vases today. Jigme Tenpai Gyaltshen was invited by his patrons to Bumthang Dezhi, Mangde Tshozhi, Trashigang, Zhongar, Lhuntse, and Wangdi Phodrang where he gave empowerments, transmissions, instructions, and performed services for subduing evil spirits. He is said to have stopped animal sacrifices (marcho) wherever he went. He rebuilt the Kurizam (bridge) in Mongar after it was burned down during a civil war. Today, the names of governors, religious masters, and noble families who contributed to the bridge reconstruction can be read on a slate at Kakaling. While living at Kakaling, a site above Kurizam he subdued an evil spirit residing below Kurizam that had been harming the people and animals of the area. In 1844, on the request of the Trashigang Dzongpon, Choje Ugyen Phuntsho, Jigme Tenpai Gyaltshen gave teachings and initiations to the local people. Like his predecessor, he refused the offerings made to him, but requested for a phurpa (dagger), since it was the dream of his root lama Jigme Kundrol to make one similar to the one possessed by his previous incarnation, which had also come from that place. The Dzongpon summoned the descendants of lugzo tralko living below Drametsi village, whose forefathers had made similar phurpa as offerings to his former incarnation. These phurpa were offered to Dorji Gyamtsho, the Second abbot of Dungsam Yongla Monastery. From there, he was invited to Dungsam, a journey he undertook to build a chorten at Yurung. From Yurung, he was invited by Gophu Choje and the public of Trashigang Uzorong to subdue the evil spirits dwelling there. There he saw the construction of Chorten Jarung Khashor with the support of Gophu Choje and the public, and consecrated it for the collective merit of the people and deterrence against the evil forces. The successive incarnation visited the chorten every year and organized religious congregations. After this brief stay in the east, Jigme Tenpai Gyaltshen returned to Bumthang to continue with his teachings. During this period, he constructed Jangchub Chorten and wrote the biography of the First Padtselling Trulku Namgyal Lhundup and other books. While he was living at Jangchub Pelri, he heard the black-necked cranes that were roosting at Chamkhar plains. Their songs inspired him to compose a song, thrung thrung karmoi luzhay and other songs like aho tashi yangchag and tashi laso lungpai phula. These folksongs are sung all over Bhutan today. Knowing that he was not going to live much longer, he appointed his student Lama Kunzang Dechen as a regent (la tshab). Jigme Tenpai Gyaltshen’s other students included Lhalung Thugsay, son of Lhading Terchen Garwang Tingzin Gyalpo, the Sixth Paro Nepu Trulku, Je Sonam Gyaltshen, Paga Geshe Tsendra, the Second Yongla Lama Dorji Gyamtsho, the Third Yongla Lama Khedrub Gonpai Choje Tsheten, Tshamdra Lama Ugyen Dorji, Paro Drak Trulku, Choying Rangdrol’s reincarnation of Kurtoe Gonpa Karpo. Among his patrons were Druk Desi Dorji Namgyal, Dorji Norbu, Trongsa Chila Ugyen Phuntsho, Wangchen Dorji, and other Dzongpons of eastern and western Bhutan. Finally, having lived a life in the service of the sentient beings Jigme Tenpai Gyaltshen passed away at the age of sixty on the Fourth Day of the Fifth Month of Iron Dog Year (1850) of the Fourteenth rabjung. Before his death in the same year, Jangchub Tsundu (1817-1856) invited him to his monastery and the two made prayers to meet in future again. So Jangchub Tsundu presided over his funeral rites. Rainbows shone in the sky and images of tutelary deities appeared from his body. Eight auspicious signs including many other significant signs were seen in the sky during the funeral.